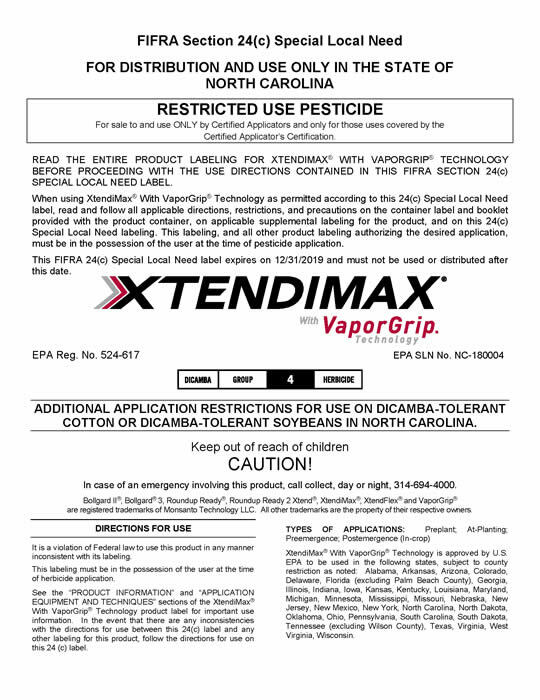 NCDA&CS will again submit 24(c) labeling for all products containing 2,4-D or dicamba intended to be used postemergence in conjunction with 2,4-D or dicamba tolerant crops (cotton and soybeans). 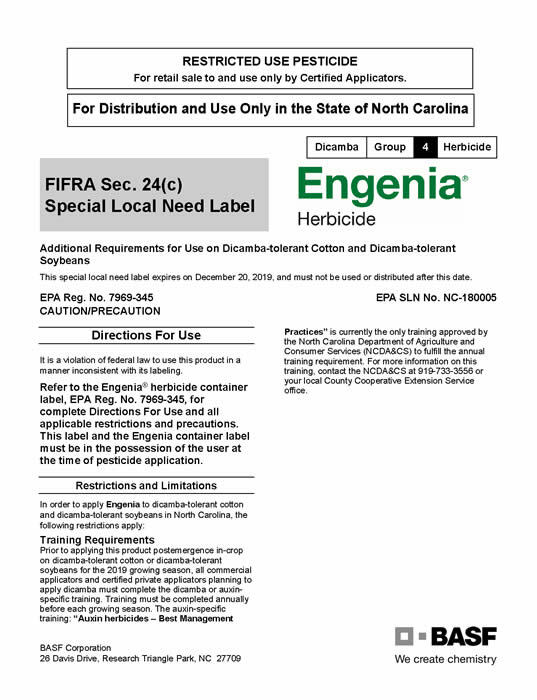 The 24(c) labels will require specific mandatory training for all applicators of these products, even applicators who attended training in 2018. 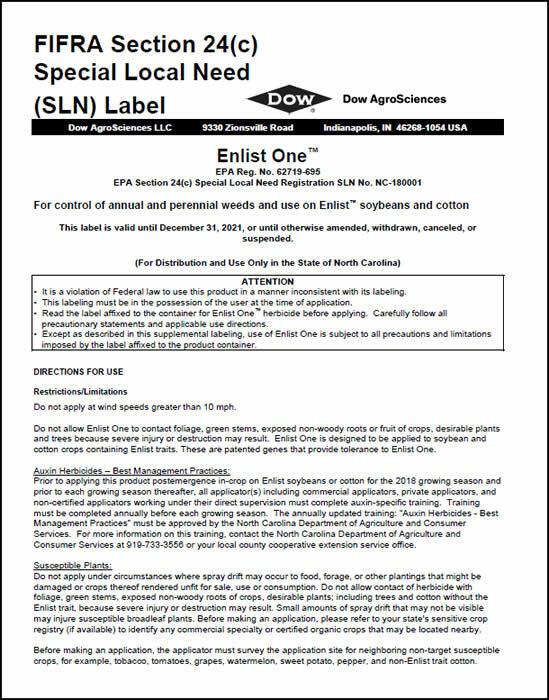 Specific restrictions will also include wind speed restrictions not to exceed 10 mph and additional NC sensitive crops which could be injured unless care is taken when applying dicamba or 2, 4-D in their vicinity. This mandatory training titled Auxin Herbicides - Best Management Practices, presented by Dr. Charlie Cahoon, Dr. Wes Everman, Dr. David Jordan, or other Cooperative Extension Specialists, is intended to assist applicators in reducing incidents of herbicide drift to susceptible crops. Again, each applicator will need to complete the training prior to use of these products. Applicators and dealers will receive 1 hour of pesticide recertification credit in categories N, O, D, and X upon completion. When using these products, applicators must have in their possession a copy of the 24(c) labeling for the product being applied. Applicators are responsible for obtaining all necessary labeling and for adhering to all the directions, restrictions, and precautions found on the labeling. 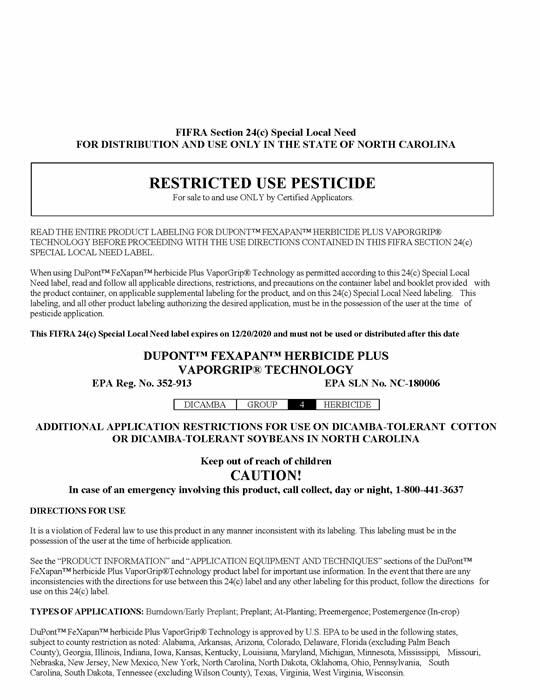 The dicamba labels require extensive record keeping, including all USDA Record Keeping components as required by 7 CFR Part 110, plus many more elements. 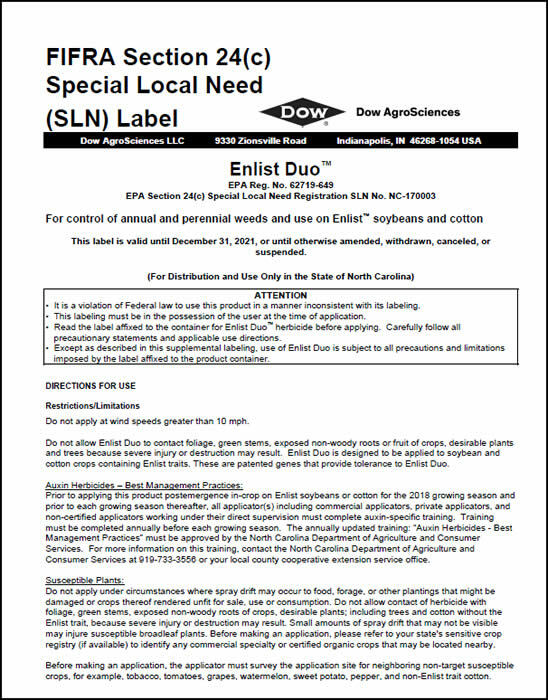 The Enlist Duo and Enlist One product labels do not require record keeping, but we do suggest that accurate records of those applications be made as well. The Enlist Product Use Guide contains record keeping requirements that should be followed to maintain compliance with the purchase agreements.